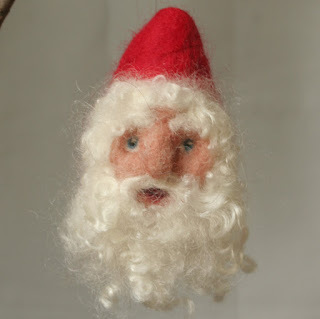 I make some Christmas ornaments, and by far the most popular are the Santa gnomes. Last year I made a couple of tiny ones which were also well received. Here's one I made for a request on Etsy. Even though it's July, it's time to start making those things for fall and winter, because people do start their Christmas shopping early. They are so smart! Get everything now, and then have a peaceful Advent. I hope I can follow their example!